I went to a 20th anniversary showing of The Big Lebowski by Fathom Events today which was the first time I have seen this movie. I know it is one of those films that people hold up as a classic, but I never thought that it would be my piece of cake. AM I WRONG? Yep, I sure was. I actually really enjoyed the movie. I tend not to enjoy those “stoner” films or the films that encourage the use of drugs. However, there was not that mush of that here, with it really being used more of a character thing than anything else. Heck, the Dude spent more time drinking his White Russians than doing anything else. 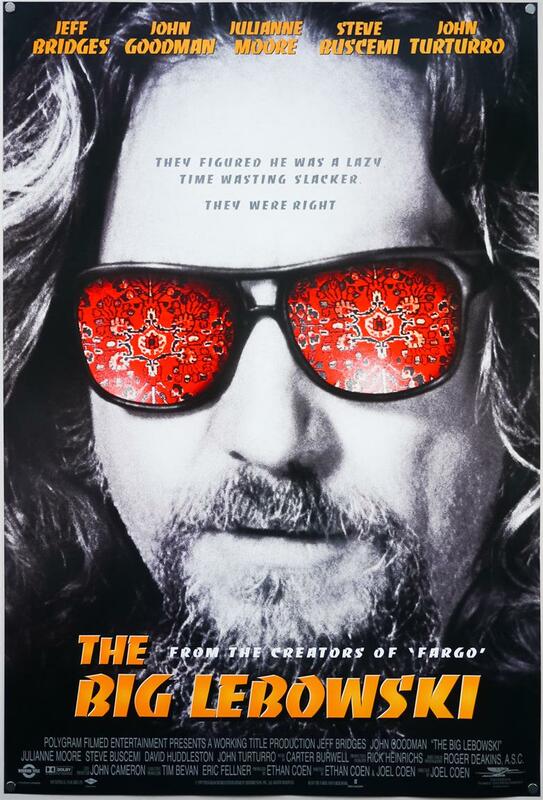 And Jeff Bridges was as charming and entertaining as just about any lead character that I have ever seen. I thoroughly enjoyed his work as The Dude. Though I was not as much of a fan of John Goodman’s character, I appreciated his commitment to the character and his performance. He was really loud and I wondered why the Dude continued to come back to him. The story itself is unbelievably convoluted and really is not the focus of the movie. It is more about putting The Dude into these different situations and watching him deal with them, and that is just fine. The dialogue is incredibly smart and witty throughout and I am sure that I missed plenty of funny lines delivered perfectly from Bridges. The Coen Brothers followed up their Oscar nominated Fargo with this film, which did not receive as much initial success, but developed over time as a cult classic. The biggest advantage The Big Lebowski has is that it is damn funny. Most of the jokes land and deliver what you are wanting. I laughed through the whole film and I had a really good time.